Eleven visuals that communicate an operating model. As some of you may know, I am writing a book on operating models, which will probably be called “Operating Model Canvas” – to connect with the “Business Model Canvas”. I am also making this the center piece of my course Designing Operating Models. So here is something I have been working on for the book – the eleven visuals. After all, one of the definitions for the word model is “a visual way of displaying how something works” (this blog has been updated a little from four days ago – so some of the comments may not fit the text exactly – but please comment). So here is my current list – and a visual showing how all these visuals fit together! The visual in the middle is the operating model canvas (POLISM – Processes, Organisation, Location, IT, Suppliers and Management System). I don’t yet have pictures of all the other visuals – but it is coming. When you look at the framework in the middle try to work out where the P or O or L fit! The little icon symbols, if you can see them, might help. Organization Model: converts the value chain map into an organization structure, and provides a framework for adding all the supporting functions and capabilities into one picture. Process Ownership Grid: combines the organization model and the value chain map into a table so that it is clear which operating processes touch multiple organizational units, where there are likely to be difficult working relationships between organizational units and which organizational unit(s) own(s) each process (or part of process). IT Blueprint: using the process ownership grid, it is possible to mark on the table what applications are needed to support each process, whether the application is bespoke or a standard module and whether the application is owned by IT or the owner of the process. There are many uses of the phrase IT Blueprint. This is a particularly high level use of the term. Management Calendar: displays the annual (or periodic) rhythm of strategic planning, budgeting, target setting, business reviews, people reviews, continuous improvement processes and other systems that run the organization. What do you think? Any thoughtful comments will be rewarded with “contributing author” status in my book (three contributing authors so far!). 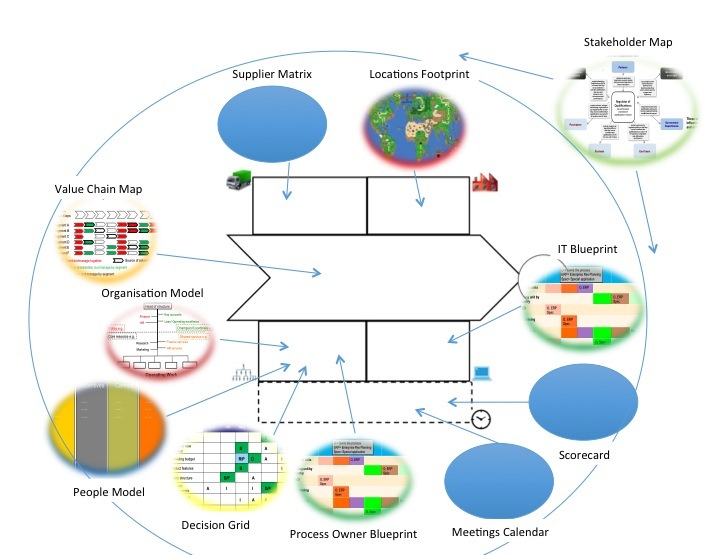 This entry was posted in Design tools, Operating Model Canvas and tagged Decision grid, IT Blueprint, Locations Footprint, Operating Model Canvas, Operating Models, Organisation chart, Organisation Models, People model, process of design, Stakeholder map, Supplier Matrix, value chain analysis. Bookmark the permalink. 26 Responses to Eleven visuals that communicate an operating model. My contribution would be to include a graphical representation of the cost base – I generally use a radar or waterfall type chart. Often I simplify this to just ‘people costs’ or ‘people costs + discretionary budgets’ and assign costs to either the organisational model or the value chain steps / streams. The idea being to give a sense of scale and the relative distribution of investment in the current operating model, i.e. showing at a high level where money is spent and people deployed within the operating model. This has proven particularly useful as a sort of baselining exercises when the Operating Model is changed to show how investment has been reallocated. Alex, I like the idea of a cost graph. Currently, I consider this to be part of the “financial model” rather than the “operating model” – but I think I need to reconsider this. I use the Dupont Model on my course Designing Operating Models, which maybe I should include as part of this list. Alternatively, I could add some cost analysis to the value chain map or the organisation chart. Maybe cost analysis is a part of all the other visuals. I need to think about this – thank you. I tried emailing you at Egremont, but the email bounced back. That’s a good selection and Alex’s suggestion enhances the visuals. I would put the Vision at the top and restrict the KPIs to the operational ones that are managed. Projects deliver change and, whilst they’re important to track, they aren’t part of a steady state operating model that lasts for longer than a project delivery timeframe. I’d also add a clear statement of whether this is ‘as-is’ or ‘to-be’ model to preempt that question. I like your thoughts Peter. The point about projects is a good one. Projects are not part of the “run” of a new operating model. They are part of the “transform” from as is to to be. But then again, all organisations are transforming all of the time. There is never really any steady state. So your management system needs a way of guiding the transforming activity as well as the running activity. Hence, I fee that projects should be part of the scorecard. Anyway, you and Alex will get your names on the “contributing author” page. My comment on Alex’s comment does not seem to have been published. I may need to make it again. I found that if one element of a rich picture like this is incorrect then people tend not to trust the other parts of it. This creates a dependency on updating the list of projects before sharing this rich picture. There’s also the question of which projects get included…there are hundreds of projects running in big organisations. Thanks Peter. Worth thinking about. Maybe it is just the format (i.e. that the scorecard will contain a list of projects) rather than the specific content that is important here. There are many different kinds of scorecards. So maybe the operating model design issue is about which kind of scorecard to use. Andrew – the missing element for me (surprise, surprise) is networks – internal and external. You could argue that you have picked it up in the stakeholder element, but as I plough on with my PhD work in this area, it is burningly clear that it is far more nuanced than just listing a bunch of stakeholders. It probably deserves a more considered conversation, but knowing the relative embededness of network connections is key. That in turn revolves around structure (of the network) and relations, it also turns out that it is the ‘portfolio’ of relationships that matters, not just any one. This is a complex area, but worth flagging in any operating model canvas I reckon. Other factors you might want to consider are real estate (i.e. buildings and physical assets) – because how they are used can often be a key part of any op model and accountability systems – performance metrics and decision systems. Richard, Yes, I do partly understand the networks point. As you say, I have it covered under “stakeholders” and “suppliers”. The supplier matrix helps identify which “stakeholders” are collaborators rather than transactional. But it does not deal with your portfolio/web point. If you develop any visual to deal with this, let me know. Buildings are included as part of the locations footprint. This covers locations, assets and even layouts within buildings. To build on your thread with Peter, I concur with your view that reviewing and visualising the key projects that are currently in train is an important element of understanding the status of the Op Model. Most of my energy in Op Model work focuses on help designing the transformation from the As-Is to To-Be / Target state which is usually supported by a series or project initiatives (or work-streams), so having an understanding of how these Op Model transformation projects sit (or indeed conflict) with the current portfolio of change is important in creating alignment and appropriately allocating resources. Peter raises an interesting point about how to ensure they are at the appropriate level which I hadn’t thought on before, my initial reaction would be to assess if they had a material impact on the Op Model elements in focus e.g. would they change the value chain or people model in question, admittedly a subjective judgement call. In terms of how to visualise I’ve typically used some sort of 2×2 prioritisation matrix bubble chart to show the link between projects – strategic priorities and the scale of investment, but now I’m thoughtful that maybe they should be mapped to your Op Model Canvas itself somehow – food for thought. I prefer to keep the transformation projects off the operating model diagram. In my mind, you have a Current Operating Model (COM) and Target Operating Model (TOM) and a programme of transformation projects to get you from the COM to the TOM. Diagrammatically, you could put two copies of your diagram on the same page, with the COM on the left and TOM on the right, and then represent the projects sitting between them, perhaps using a Gantt chart, roadmap or other suitable diagram. It might have to be a big page (!) but that would give the most accurate representation IMHO. Point 3 in the video I posted at http://strategiccoffee.chriscfox.com/2016/05/6-tips-for-how-to-pick-best-kpis-for.html also makes a good case for not including projects on your scorecard, as they result in binary (yes/no) KPIs (did we complete the project or not?) which are poor for tracking progress. I infer from it a hierarchy of KPIs with quantifiable KPIs being the best quality, qualitative KPIS (red/amber/green) being second best, and unidirectional binary KPIs (finished or not yet finished) being a poor third. Of course, there are lots of other ways of tracking progress against projects, but I believe that these should be kept off your strategic dashboard. I think what I was trying to say is that you do need project tracking, but that you should keep this separate from your strategy scorecard. The problem with simplistic on schedule/behind schedule or even red/amber/green indicators is a combination of them being (a) highly politically charged (no-one wants their project to be the one that’s behind) and (b) easy to manipulate. Rather, you need more nuanced tracking of Time (schedule), Quality and Cost (the TQM triangle in project management). I’ve seen a lot of time wasted by people fiddling the system to ensure they can report green against some project criteria without any consideration as to whether what they are doing will get them any closer to achieving the actual strategic goals or not. I think that your strategy scorecard should measure the efficacy of the operating model, as it stands, to achieve the strategic goals and objectives of the organisations, and a separate scorecard, nuanced around different criteria as outlined above, should track your ability to change the operating model to one which does so more effectively. Going back to my previous diagram idea, your COM maps to the current / actual scores on your scorecard, your TOM maps (at least aspirationally) to the future target scores on your scorecard, and you need a completely different set of metrics to track the delivery of the programme in the middle. Useful build Chris. Thank you. Your name will join the list of contributing authors! I do like your canvas already a lot. Over the last years I have worked many times with the Business Model Canvas (BMC) and Value Proposition Canvas (VPC) – and the lack of an operations view in the BMC was always unsatisfactory to me. What I found very beneficial for my audience when using the BMC is to visualise that the left side is representing the “Supply Side” and the right side of the BMC the “Demand Side”. For the sake of “consistency” (even if not necessary) with the BMC I would like to see a relatively clear match towards the components in the BMC (e.g., your “people model” with the BMC “Key Resources”; your “Supplier Matrix” with the BMC “Key Partners”). I assume the “Value Chain Maps” should cover “Key activities”, and I would like to check my thoughts as soon as you publish the visuals on this. To build on the feedback/comments between yourselves and Chris Fox: I agree to have the support for transitions/transformations driven by e.g., changes on the business model. Both the downstream/upstream between the BMC to your OMC as well as the delta between the OMC for the COM and the OMC for the TOM. I agree that the major challenge is to visualise and measure. I have bridged this gap (COM to TOM) with classic approaches on “Transition and Transformation” (Knowledge Acquisition, Shadow, Reverse Shadow, Run). By reconsidering my earlier thoughts where the left side is the supply side and the right side is the demand side, this re-application for COM to TOM is working too. Hope this is food for thoughts and useful for you. Matthias, I have tried to edit your contribution a little – partly because I was not certain that I understood all the points you are making. Yes the OMC is the back end of the BMC (the supply rather than demand end). Yes there is some overlap with the BMC categories. But also there are parts of the OMC that are missing from the BMC, which is why it is a step forward. I am not sure that I understand the point you are making about transformation – although I get that you agree with Chris Fox. Andrew, thanks for posting this, and for your continued work in this field. Maybe I’m missing it, but there’s a gap for me around a more “outside-in” view of the operating model, i.e. how customers access (or even co-create) the value that the operating model delivers. I’m thinking of elements such as products, the services, and the channels that they are delivered through. This would take the work you have done on value chains a step further and enable exploration of the complexity required to support different distribution models and channels strategies. I know there’s an argument to say that this is more in the demand / proposition space and should therefore be left to the BMC, and that the operating model should support it but not include it. While the BMC does cover this at a high level, for me there is value in the operating model including a more detailed view. I’m finding increasingly that the customer is playing a significant role in the delivery of services rather than just being a passive recipient, especially where omnichannel / digital services play a major role, so it is vital to consider product / service / channel as part of this. Hope you find this input useful, looking forward to the book. Stephen, What a great comment. I absolutely understand your point, and it is something I have been wrestling with. My conclusion, and I probably need to make this clearer in my book, is that the operating model deals with these issues through the “value proposition”. It is the value proposition that is the transition between the back end of the BMC (the operating model) and the front end (the customer model). The value proposition may be a co-creation one or it may be a transactional one. The key is to design the operating model so that the relationship works. This is actually the same at the supplier end. Some suppliers are co-creators and the relationship needs to be design to make this happen. The tricky part is that operating model work is responsible for designing the supplier co-creation relationship, but not the customer relationship (which is designed in the customer model). I guess one has to draw a line somewhere. I am not sure I have drawn it in the right place. Stephen, I will add you name as a contributing author! I usually draw an ‘onion’ picture to represent this point. Operating models don’t always review the ‘onion’ but operating model documentation is vital to show how the company creates the layers and the links between the layers. … and then I use the OMC to explain the detail of the organisation. Peter – see my comment on your other note. Fascinated to learn that you are using the OMC. In the latest draft of my book, I am giving more emphasis to the “value proposition” as the link between “customer persona” and OMC. We should discuss. Helpful thoughts Richard. But I find your phrase “value delivery model” could mean the value chain (operating model) or the value proposition (not operating model in my view). I assume it means the latter. Yes organisations have multiple TOMs as they have multiple organisation structures. There are TOMs for each business and for each function and for the whole organisation. Yes Andrew, you are correct in that assumption. I was referring to the value proposition, noting that it is a mutual notion (i.e. value for the customer and value for the organisation). I tend to think of this as a customer x service portfolio (i.e. what are we providing and to whom), the point I was then making is that the configuration of the OM enables this value creation (for better or worse). The value chain therefore represents the activities that connect together to enable the value yield. The activities in turn are embedded/enabled by the OM. I think that increasingly aspects of operating models extend beyond the boundaries of the firm, and so I anticipate that you will explore this issue as part of the overall picture?